The investment brings to an end Oyo’s nearly $1.1-billion Series-E funding round that saw participation from SoftBank Vision Fund, Didi Chuxing and Grab. The partnership could also lead to synergies in China, experts and industry watchers said, where Oyo has expanded quickly and is operating in 280 cities with 5,000 hotels and 260,000 rooms. 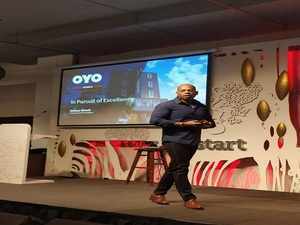 BENGALURU: US home-sharing company Airbnb has invested $75 million (Rs 516 crore) in SoftBank-backed hospitality firm Oyo, regulatory filings sourced from business signals platform Paper.vc showed. The investment brings to an end Oyo’s nearly $1.1-billion Series-E funding round that saw participation from SoftBank Vision Fund, China’s Didi Chuxing and Singapore-based ride-hailing firm Grab. A spokesperson from Oyo confirmed the investment from Airbnb and the closure of the round. The investment from Airbnb was made at the same $5 billion valuation at which Oyo raised $800 million led by the SoftBank Vision Fund, and $100 million apiece from Grab and Didi Chuxing. Oyo did not elaborate on possible synergies with Airbnb post the investment, but the Gurugram-based firm could potentially give Airbnb access to its 173,000 rooms spread across 259 cities. Oyo will get access to Airbnb’s large global traveller base and Indian users as well. ET had reported on April 2 that both companies were exploring several opportunities to collaborate in India, including making Oyo’s inventory available on Airbnb, citing sources within the company. It is estimated that Airbnb has 45,000 listings on its platform in India. In February, Airbnb cofounder Nathan Blecharczyk told ET that India was among the top five fastest-growing markets for the company. The US firm’s investment in Oyo comes ahead of its plan for an initial public offer, which could possibly take place in 2019. China has been a market where Airbnb has failed to gain a foothold and compete with local players.